A day earlier, the authoritative Asharq Al-Awsat reported: ”Tel Aviv has informed Moscow about its decision to ‘expand the scope of its red lines’ in Syria by preventing Iran from consolidating its military presence and that of its militias, including Hezbollah, across all Syrian territories, and not just in the south.” This publication is linked to the Saudi royal house and when it cites “Western diplomatic sources,” it must be presumed to have checked with the Saudi strongman Crown Prince Muhammad bin Salman before going into print. Israel’s military effort – usually unacknowledged – was confined hitherto to operations against Iranian bases, command centers and weapons deliveries in southern and central Syria, or against facilities shared by Hizballah and Iranian Revolutionary Guards units. All the signs, therefore, indicate that, henceforth, Israel’s operations are to be broadened in range up to the Syrian-Iraqi border and in the west up the Lebanese border, possibly impinging on Syria’s neighbors. This would tie in with the fact that Iranian forces in eastern Syria depend on fighting strength and supplies coming in from the pro-Iranian Shiite militias in Iraq, while in the west, they are heavily supported by Hizballah from Lebanon. This shift marks the onset of the next stage of Israel’s military campaign for eradicating Iran’s military presence in Syria after the first four-month stage, which began in February, had run its course. This may never be acknowledged in full, but the fact is that IDF operation seriously disabled Iran’s deployments and command centers in areas ranging from around Damascus up to the Israeli border in the southeast, as well as knocking out Iranian radar and air defense capabilities. Extensive damage was also caused to important Iranian arms consignments of long-range Fatteh 330 surface missiles and advanced mobile anti-air Bavar-373 missiles, the Iran-made version of the Russian S-300. But still, Tehran has been able to preserve the backbone of its military command formations in Syria and they are fully operational. The exact date for the next phase to begin is impossible to establish for sure. 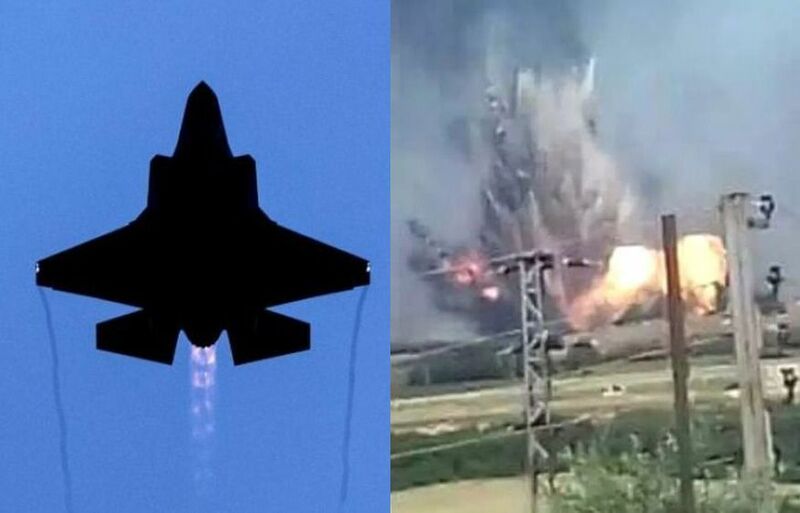 Maybe it already has, with the strike on the military airport near Hama on May 18, which was conducted by a ground force rather than the air; or the air strike on Friday, May 25, on Dabaa Military Airbase where Hizballah and foreign pro-Iranian militiamen were housed. Hizballah’s leader Hassan Nasrallah later accused Israeli warplanes of this attack. Neither Iran nor Hizballah appears yet to have decided how to come to grips with the second stage of the Israeli offensive in Syria – especially when their main backer, Moscow, has been put in the picture by Israel. I think the air superiority as well as the intelligence technologies that Israel has is the dominant factor, providing Israel with the upper hand in this conflict for which Iran will not be able to overcome. A lot of that may depend on the “Russian factor” (i.e. just how much the Russians may wish to get directly or indirectly involved in any upcoming scenario). Russia is the main player, and there are common interests between Russia and Israel. They want Assad in power and their bases operating, but now the opposition is weak, they don’t want Iran foothold there, so they let Israel wipe them out. Iran due to change venue and tactics. Iran/PDRK links are known. USA southern flank not well protected against missile launch…. Iranian nationals in USA might strike utilities like the 16 April 20134 Metcalf Substation template. EMP/CYBER expert on Fox Levin program last night . Pry is foremost US expert on EMP attack likelihood. Coincidental revelation of schooling of Mexican Drug cartels on methods of cannabalism speaks to expectations of US famine after EMP. Not considered strategic necessity here, nonetheless must state need for enhanced US railway links into food production regions as circa 1960 & previous rail based economics era. Reform Military RR Units etc. This is a coming scenario and USA needs enhanced rail transport famine hedge. Israel has a stake here…. Hopefully, the USA already has an “emergency plan B” ready to go in the event of such a scenario. The question, however, is: how long will it take for any such “emergency plan B” to be effectively implemented throughout most of the USA? No no no … This “Tahoe Valley Lines” is just a railroad nut, he somehow believes the whole US can be hit with a blanket EMP and is using it as a vehicle to further his choo-choo agenda. Please don’t dig and indulge his acrynom heavy nonsense posts. Interesting and crazy idea , providing that Israel now will cover Iraq and anywhere ; One3 problem , there is also Turkish and Chinese interest . Did Israelis informed these ? It might be just possible that Israelis will have their fleet of F35s slightly go down in numbers . And maybe the fight might just happen this time in Israel itself , Since no borders mean no borders , what anyone thinks , they will have it going forever ? Israel will find out that Jordan might get eliminated for its stupidity , and than only sea and USA will be salvation , if no one will drown both countries before that .Peace needed not USA . TVL thinks we need more choo-choo’s and he is willing to spout some ill-informed fringe possibility to justify a golden age of rail transport. Zoo animal status – behind the barrier please do not touch or feed this creature. Closest thing to plan B as far as supplemental US transport/food distribution aside from rail mode are military vehicles already having Faraday Cage protection on vehicle engine control electronics. Also, a number unknown of large AWD Oshkosh units similar to equipment seen as airport crash/rescue trucks. Try to understand military parlance definition of rail assets: “Second Dimension Surface Transport Logistics Platform” defines railway role and ability to operate outside of US Strategic Defense Highway Network. When 1956 Defense Highway Act set in motion “Just-In-Time” food distribution methodology, USA still had some 100.000 rail branch miles, capillaries if you will, giving comprehensive reach to food production regions. Every city down to small communities had local warehousing for victuals transfer from rail to local delivery to stores. DOD authorities such as General James A. Van Fleet made urgent appeal to the Joint Chiefs and the Congress to maintain sufficient rail capability to sustain and recover from attack resulting in motor distribution breakdown. The military rail operations transportation units component on Ft. Eustis VA template ended with stand down from the Vietnam War. Van Fleet was prescient; this can be seen in recent book by Peter Vincent Pry, a sobering compendium of Cyberwarfare (in motion) and EMP threat (PDRK now capable via Troposphere detonations). See Pry interview on Life Liberty and Levin (FOX) last Sunday night. Peanut gallery read up on Richard Clarke’ Ted Koppel and William Forschen ONE SECOND AFTER. Why are the Mexican drug cartels studying Cannabalism? See Richard Vincent Pry interview on Life Liberty & Levin (FOX) Sunday night. See also books: Richard Clarke & William Forschen “ONE SECOND AFTER. Plan B is maybe too secret to be implemented after the fact. Military does have large number of Oshkosh AWD vehicles to maintain US Base resupply when roads are unuseable or gridlocked. Famine Hedge requires robust post EMP transport. We lost Military railway units after closure of Ft Eustis VA. The Mexican Cartels’ answer to North American Famine is cannaballism (not cannabis). A WMD or any other mass attack on the US by Iran or it’s terrorist proxies will result in 100 fold retaliation from US, and it will not end with just a regime change, but total destruction of Iran. Tahoe Valley Lines should be Tahoe Valley Lies. TVL is a nut case paranoid delusional fool. If US sanctions against Iran isolate any business or trade deals from the US international banking system, many European companies which had been “falling all over themselves” to do trade deals with Iran when the “nuclear agreement” first went into effect will have to pull out from their dealings with Iran or face consequences from the USA, thus making any negotiations with Europe irrelevant. Note that Iran had already stated that they will not accept any changes what so ever to the original “honey of a deal” given to them by Herman Munster and his gang, so what’s the point? More opportunities to test the latest US hardware by the Israelis and to suggest any needed modifications, enhancements or upgrades before the USA has to use them either in the Middle East or elsewhere. Most of all, Iran is waiting for the results of Trump – Kim summit. There is many of dark ties, commercial and others between NK and Iran. If the summit results in a breakthrough many ot these ties will be exposed and many communication channels between the two closed. Iran is preparing to this possibility and results of its decisions may be surprising. Strike like King David and Jehu did. 19As if a man flees from the lion and the bear meets him, and he comes to the house and leans his hand on the wall, and a serpent bites him. “Son of man! The house of Israel has become dross to Me; all of them are copper and tin and iron and lead in the midst of a furnace; dross of silver have they become. Therefore, so said the Lord God: Because you have all become dross, therefore behold, I gather you together into the midst of Jerusalem. 29The people of the land have practiced oppression and committed robbery; they wronged the poor and the needy, and oppressed the stranger for lack of judgment. 30And I sought of them a man who puts up a wall and stands in the breach before Me, for the sake of the land that it not be destroyed, but I did not find. 31And I poured out My fury upon them; with the fire of My wrath I destroyed them. I put their way on their head,” said the Lord God. God bless Israel, . . .
Keep her strong, focused, and ready, . . . the foes are indeed massing. They will die upon the mountains of Israel, . . . and burying them will be a massive undertaking. The FAGATOOLAH must be getting Cold Sweats as he cuddles nest to his Favorite and SEXIEST Camels at night. It is amazing that you read Debka files and you think that what you read on here is true. You people are really twelve or just stupid. This isn’t happening at all. I am nor even sure that Iranians have the Bevar missile system in Syria it is part of their national integrated system. they do probably have there Tor M. and the Buk. there I think that Only Syria can be in charge of their air space. Why don’t you all just calm down. How many you live in Israel? IT APPEARS THAT IRAN WITH HEZBOLLAH AND THE PALESTINIANS ARE PLANNING ON USING CARS LOADED WITH EXPLOSIVES BOTH PARKED AND DRIVEN BY SUICIDE DRIVERS TO TARGET TEL AVIV. THEY ARE PLANNING ON USING THE SAME TACTICS THAT WAS USED AGAINST THEM BY THEIR OPPONENTS IN BEIRUT AT THE BEGINNING OF THE WAR IN SYRIA. THEY ARE USING PHONY AND STOLEN YELLOW LICENSE PLATES TO HIDE THE BOMB CARS COMING OUT OF THE WEST BANK. ISRAELI LICENSE PLATES AND HEADING TOWARDS TEL AVIV. CORRECTION: THE BOMB CARS HEADING TO TEL AVIV APPEAR TO BE COMING FROM ARAB VILLAGES IN GALILEE AND HAVE LEGITIMATE ISRAELI YELLOW LICENSE PLATES. CORRECTION: YOU ARE A PSYCHO! NCR IRAN KNOWS WHAT IRAN IS DOING. Iranian rockets would likely overwhelm the Iron Dome and cause significant damage to civilian areas in Israel. However, Israeli military bases are almost entirely underground and hardened. Rockets don’t penetrate bunkers. You need heavy bunker-buster bombs dropped from large bombers to do that. Israel’s military would remain operational and retain the ability to hit-back. Israel would likely attempt to take out most of Iran’s rockets in a massive preemptive attack if they thought a war was coming. Israel has huge numbers of well stock bombed shelters, so in the event of an incoming rocket attack, the civilian population would head underground. Their homes and offices might be destroyed, but most of the population would survive. A direct war between Iran and Israel would quickly drag in other players. The U.S. and Saudi Arabia would likely enter very quickly on Israel’s side. Russia would increase arms sales to Iran, but Russia isn’t going to insert itself militarily on behalf of Iran. They will protest at the U.N. but will not directly engage the U.S. or Israel. Iran is box in and its only exit is Iraq Tanaf crossing. Iraqi troops are carrying out military reinforcements as well as erecting security barriers along the borders with Syria. The U.S. forces are now situated in two camps, one at the Iraqi Tanaf crossing, and the other near the phosphate mines south of Qaem, Anbar. Syria is surrounded, Putin want a political settlement. Russia and Iraq want support Iran’s war with Israel. The Iranians spend half their time screaming “death to America” and “death to Israel.” As far I’m concerned, they should be wiped out. They are hideous bassholes.